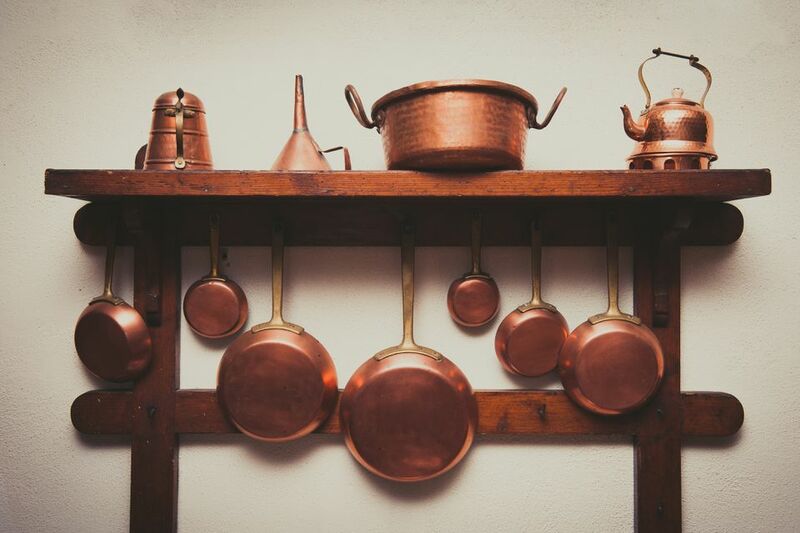 Saucepans, Dutch ovens, sauciers, crepe pans, fry pans, skillets... What are they all for? Here are some photos and descriptions to help you decide which to use. Saucepans come in many shapes and sizes. They have vertical sides and are used for boiling and simmering. Larger saucepans might have the standard long handle and an extra loop-style "helper handle" on the side, while the large sauce-pots have a loop handle on each side for lifting. The saucier is the ideal pan for making sauces. The wide bottom makes for faster reductions and the rounded sides are excellent for stirring and whisking. A frying pan – also known as a skillet – has a wide heating surface and shallow, sloping sides. A double boiler consists of two pans with handles, an outer pan which holds the water and an inner pan which holds the food to be cooked. The inner pan fits into the outer pan, but should not touch the simmering or boiling water. The boiling water method provides some insulation from the direct heat, making it perfect for delicate sauces, chocolate, or other application requiring a more gentle heating method. A sauté pan is a shallow pan similar to a skillet, but has straight sides instead of the angled sides of the skillet. The straight sides give it a larger cooking area then a similarly sized skillet, making it an excellent choice for searing, sautéeing, and reducing pan sauces and gravies. The sauté pan can be used for any recipe requiring a skillet. They come in a wide range of sizes and are often sold by capacity (4-qt, 3-qt, etc.) as well as circumference. Dutch ovens are usually made of cast iron and are used for many cooking tasks on the stovetop and in the oven, and some are designed specifically for the campfire. Dutch ovens are especially well-suited for long, slow cooking, such as braising or roasting meat, soups and stews, and casseroles, but can cook just about anything that can be cooked in a conventional oven. Dutch ovens for camping are made with legs and usually a bail handle. The top is slightly concave so coals from the fire can be placed underneath and on top of the Dutch oven. The stockpot is the ideal pan for making broth or stock, or any stovetop soup or stew in large amounts. It's also an excellent choice for boiling lobster or other shellfish. Stockpots might be made of stainless steel, aluminum, or other metals. Some pans might have bottoms made of layers of metals. If you use an induction cooktop or range, check to make sure the pan will work on induction. Cast iron skillets and pans are excellent pans because of their ability to conduct heat, but some foods should be avoided. Because iron is a "reactive" metal, the flavors and even colors of acidic foods such as tomatoes and vinegar or wine-based sauces might be altered. Older, well-seasoned pans will be a bit less reactive than newer pans. Use cast iron for pan searing and roasting, baking cornbread and other breads. They're also perfect for long-braised stews and meats. Enamel-lined cast iron can be used with more acidic dishes. Slow cookers are useful and convenient. A slow cooker is an excellent choice for slow braising, and they can be used for many other dishes. Slow cookers usually cook at temperatures from 200 F to 300 F, and come in a variety of sizes. Some are multi-taskers with a much broader temperature range. Many have built-in timers and "keep warm" settings. Baking dishes come in all shapes and sizes, some with covers and some without. Baking dishes are used to make main-dish and side-dish casseroles as well as many desserts. If you don't have a casserole dish or the right size baking dish for a recipe, a baking pan or oven-safe Dutch oven or saute pan can be used. Baking pans can be used for a variety of sweet or savory baked dishes. From lasagna and roasts to cobblers, brownies, and cakes. They come in a variety of shapes and sizes, such as the standard 9-inch by 13-inch rectangular pan, square pans, circular pans, and Bundt pans. A jelly roll pan is a rimmed baking sheet with a depth of 1 inch. They are generally either 15 1/2 x 10 1/2 inches or 18 x 12 inches. The 18 x 12-inch is also called a half-sheet pan. The pan is used for making the sponge cakes used for jelly rolls, and it is also excellent for baking cookies, roasting vegetables, baking chicken wings, and other foods needing a large, shallow rimmed baking sheet. Set a pie or casserole on a jelly roll pan to catch spills. The large jelly roll pan is ideal for holding a rack to cook meatballs, or line it with foil to bake bacon. Pie plates and pans come in a variety of sizes, from deep dish and oversized to the standard 9-inch. Glass pie plates are said to be better for even browning. For the bottom crust in a standard size pan or plate, roll the dough out until it is about 12 inches in diameter, or about 3 inches larger than the diameter of the pie plate. Once the dough is rolled, fold it gently in half or quarters. Lay it on the pie plate and unfold. Press into the plate without stretching, leaving an overhang of at least 1 inch. Trim excess uneven edges. For a one-crust pie, flute or decorate the edges then fill and proceed with the recipe. For a two-crust pie, add the filling to the bottom crust. Cover with the top pastry. Fold the top pastry edge under the edge of the bottom crust, then seal and flute or decorate the edge. Cut vents to allow steam to escape. Bake according to recipe instructions. How Do You Use a Tawa to Cook Indian?